Mad Vac Model 61- Bortek Industries, Inc.
Madvac has developed the model 61 to be the ultimate portable vaccum system. The unit easily attaches onto the back of a trailer and it’s 40′ hose reaches all of those areas ridable litter collectors can’t get to. 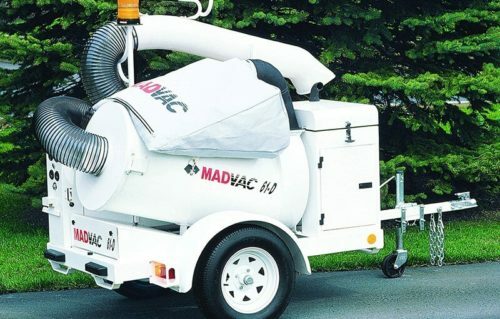 Madvac has developed the model 61 to be the ultimate portable vaccum system. The unit easily attaches onto the back of a trailer and it’s 40′ hose reaches all of those areas ridable litter collectors can’t get to. The perfect applications for this equipment include collecting debris around and stuck in fences, parks, and parking lots, etc. • 13.8 HP Kubota liquid-cooled engine, 6 gallon fuel tank. • Suction with no restrictions. • 60 gallon capacity: 120 gallon debris capacity compacted into an 80 gallon bag. 2:1 self compacting vacuum system. • No-jam fan is completely protected from contact with any litter. • Optional hose extentions of various sizes: 15′ & 25′ with an 8″ diameter available. • Operator ease: Storage rack for vacuum hose, handheld pvc nozzle is lightweight, fork-lift access, all welded steel frame, and a storage compartment for bags and tools. • Emergency stop button and warning light. • Optional bagless debris system (kevlar). • Water drains in debris container. • 12 volt electrical system.